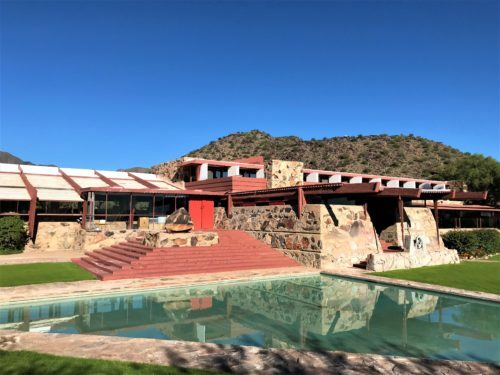 I returned last night from Phoenix after a spellbinding architectural tour, largely focused on the legendary Frank Lloyd Wright. North Carolina Modernist Houses offers a dizzying array of tour opportunites each year. 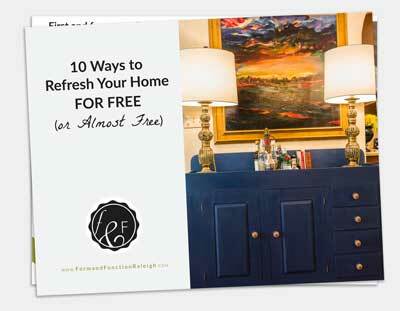 This one appealed to me since I could tempt Mr. F&F to join me with the promise of desert sun and golf. So my patient hubby finally experienced an NCMH tour up close, after years of my long-winded architectural tales. 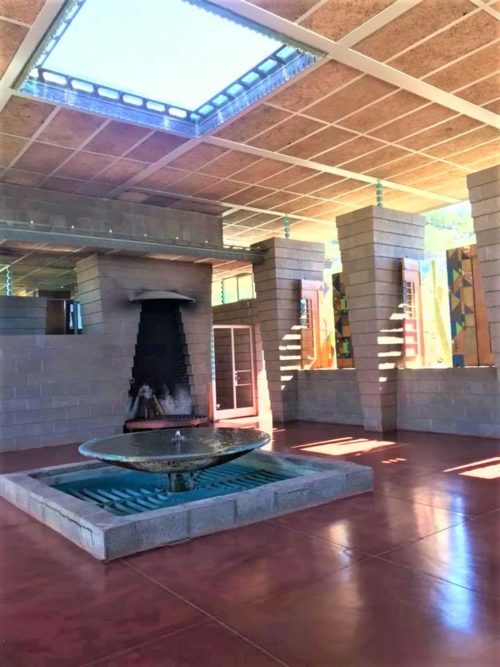 This tour which comprised mostly Frank Lloyd Wright inspiration, also included side trips to Bruder designed Burton Barr Library and Paolo Soleri’s Cosanti and Arcosanti complexes. Below are some of Frank Lloyd Wright quotes paired with my photos. 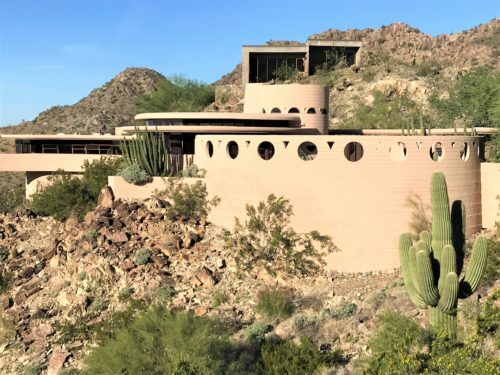 So much of his desert modernism represent Wright’s devotion to nature, his iconic horizontal lines and all that defined his organic architecture. Yet, there are some unique qualities that distinguish it from his midwestern prairie style. The tour felt like a five-day crash course in all things Wright. 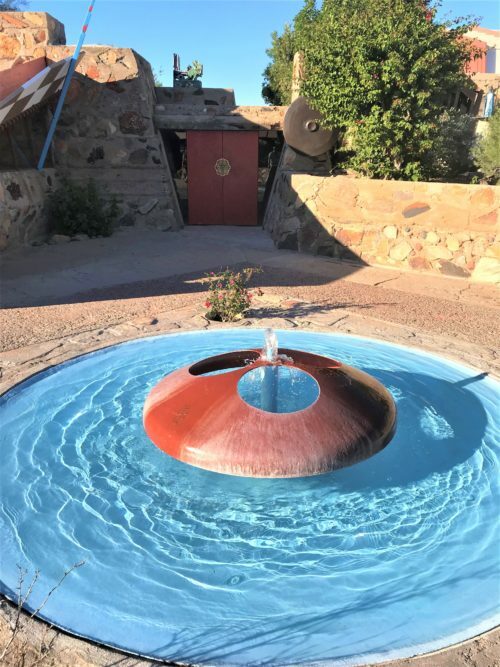 Wright’s water features, so abundant in his desert landscape, are simple and inviting. 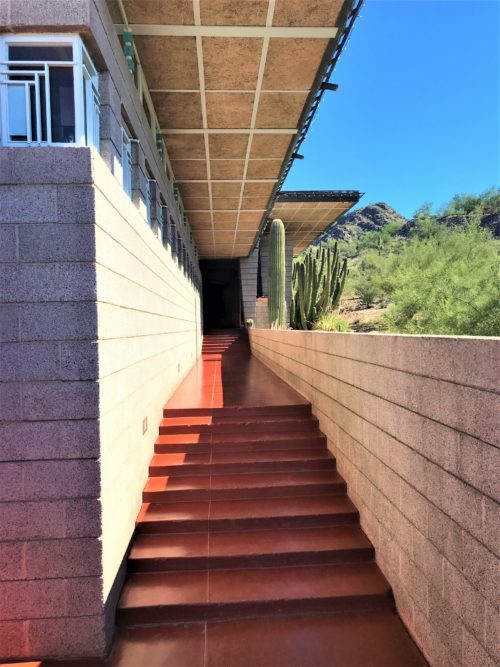 Often near a door, they provide a calming effect and a welcoming environment upon entering the buildings pictured here at Taliesin West. The simple lines on this church, First Christian Church, invite contemplation, perfect for a place of worship. Though Wright himself was not religious, he respected that in others and in his design for this church. 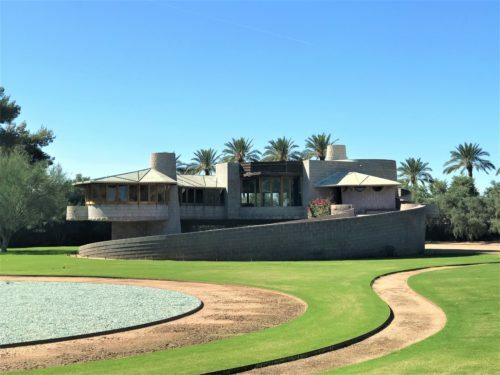 Wright’s desert modernism exemplifies some of his best nature-inspired work. The curves of the Lykes house below repeat the sensuous curves of the mountains in behind. Desert plants and rocks are abundant with the raw landscape largely left untouched. 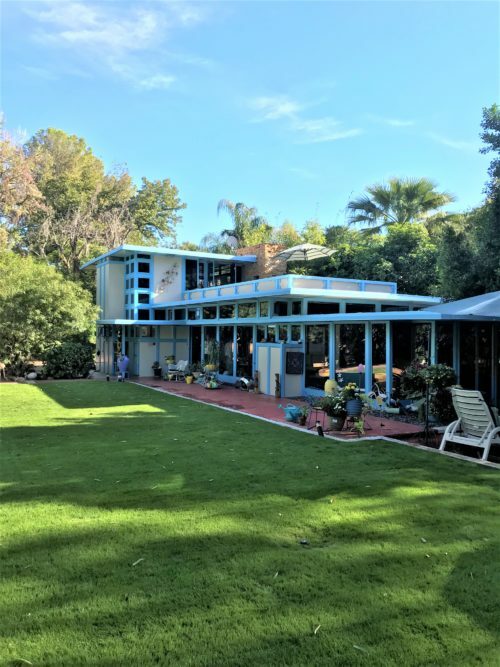 This outdoor atrium for the Harold Price House blurs the line of inside and outside, since it acts as a connector between the sleeping and living quarters. The impluvium provides a cooling effect in the desert climate while the outdoor fireplace does the opposite on chilly nights. The atrium allows for living with nature, except during the hottest days of summer. 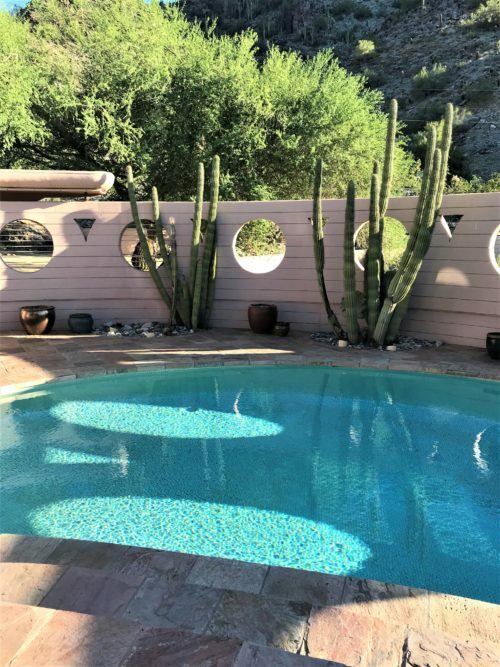 The Lykes House pool area repeats a circle motif and allows a peak at the nature outside while safely tucked inside the patio. The Lykes House truly illustrates this notion, belonging to the hill in behind (you can buy it for a cool $3.25 M). Unfortunately, notice the other boxy house built on the hill in the back. Thankfully, Wright did not live to witness that, otherwise he might have knocked on the door to offer his opinion. 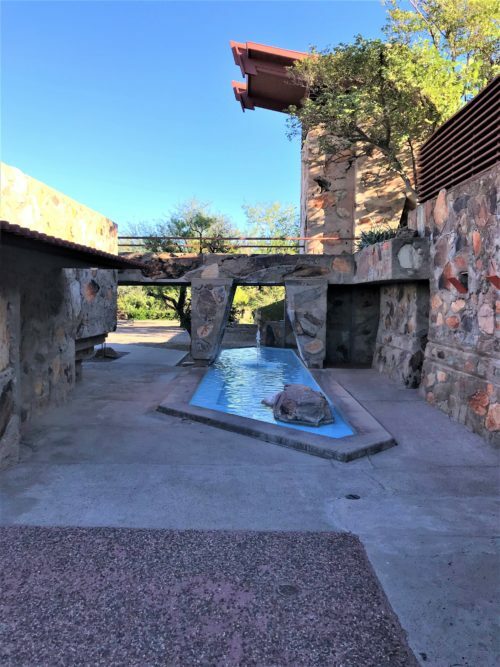 Taliesin West, Wright’s desert home, studio and school, blends seamlessly into nature and still operates today. 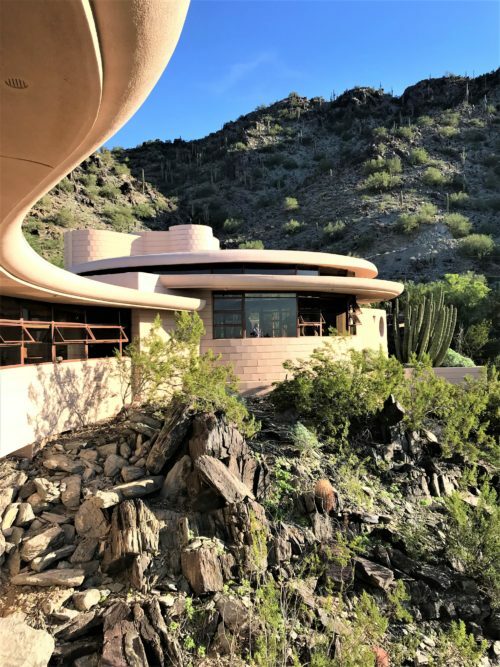 The David Wright House, built for FLW’s son, was sited for optimal views of Camelback Mountain. Currently on the market for $12.9 M, it could be yours. Wright’s collection of Japanese art inspired his architecture, including the design of his “art glass” windows. 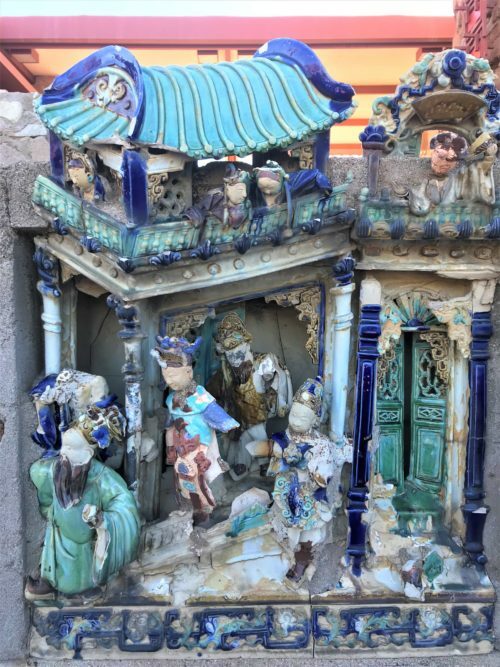 So, while surprising, these porcelain pieces imbedded into outside walls at Taliesin West seem fitting ornaments, given the influence of Japanese style in his design. 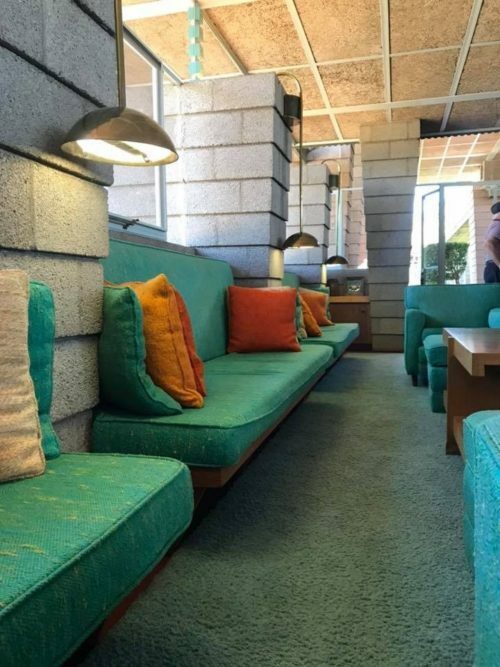 The turquoise was such a surprise at the Raymond Carlson House, yet these colorful lines differentiate Wright’s desert modernism from his midwestern architecture. The lighting that flanks the banquette seating adds simple elegance and appropriate ornamentation to the Price House living room. Ah…I saved my favorite for last. Form and Function. Get it? Wright’s mentor, Louis Sullivan, was credited for the oft misquoted line. I love that Wright truly looked for opportunities to combine form and function. Take these beautifully painted doors below at the Price House, for example. Before the door installation, the owners called after they returned for the winter, only to find their beautiful atrium covered in tumbleweeds, evidence of animals and generally a mess. The open walls to the atrium were not practical, hence the beautiful doors became a necessary addition. 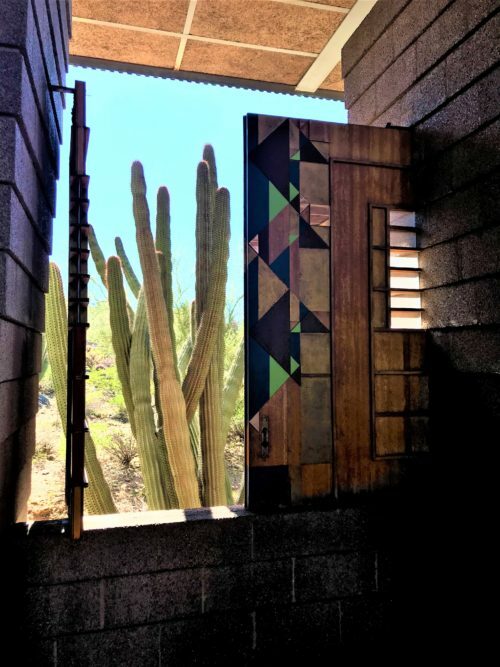 Deep, beautifully designed overhangs display classic Wright “compression” upon entering but also reflect the need for protection from the hot desert sun. The small decorative windows frame living room bookcases on the inside while larger windows on the opposite side capture less direct sun. 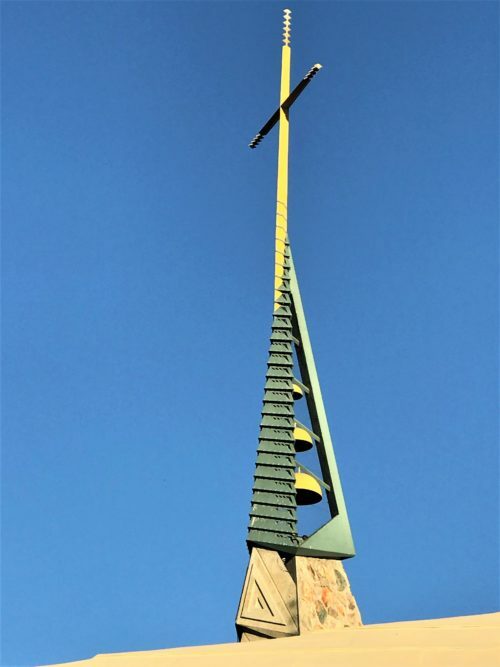 The beautiful First Christian Church spire also houses the church bells. Simple, elegant and functional. 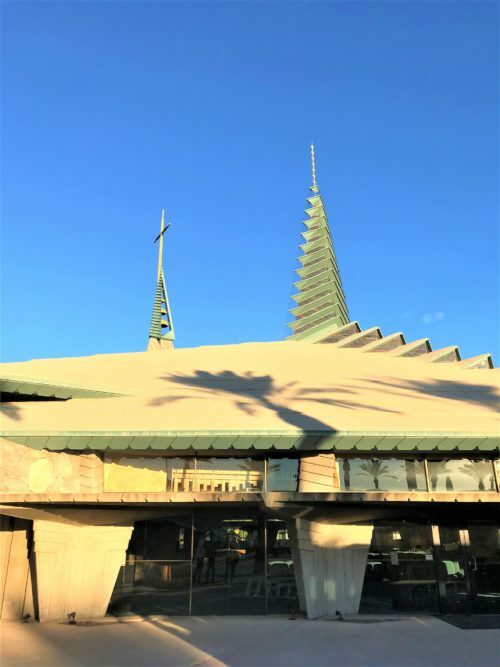 For more about modernist architecture tours read here and here and finally, here. Can’t wait to hit the modernist trails again! 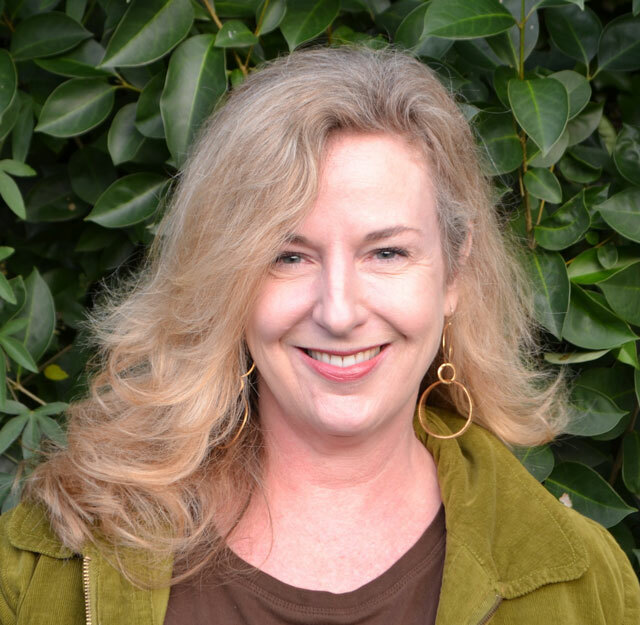 Amazing Carole! What a lovely tour and educational read. What a great trip, photos and post! Thanks for sharing it all. Now I can see that not all of his houses were dark! Great recap of a fabulous trip!